“Not That Kind of Girl”….are you? 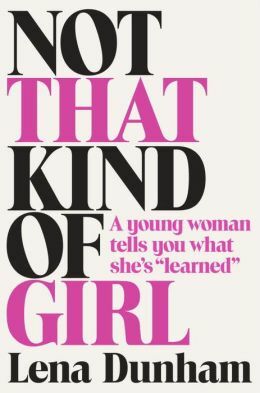 Last night, I finally finished Lena Dunham’s book “Not That Kind of Girl: A Young Woman Tells You What She’s ‘Learned'”. It’s by far my favorite book of the year. I really connected to this book. Lena did a wonderful job of describing what it was like growing up in a creative environment, boy struggles (as a teenager and in your 20s), and made me feel like there was someone out there that actually got what I was going through. I also loved how she described her struggles with the entertainment business and being taken seriously as a young woman. It’s something I struggle with all the time, and it was re-assuring that a badass like Lena Dunham has gone through it too. Your young 20s are such a weird phase in life. I’m not an adult, but I’m no longer a kid. This book made me feel okay about all the stupid stuff I’ve done and the bad decisions I’ve made. Lena is a beautiful writer and I can’t wait for her to publish another book. In the meantime, I will patiently wait for the next season of Girls to start. If you haven’t read this book yet, pick it up from your local bookstore. Like, now. Seriously. Leave a comment below and tell me: Have you read Lena’s book yet? What did you think about it?